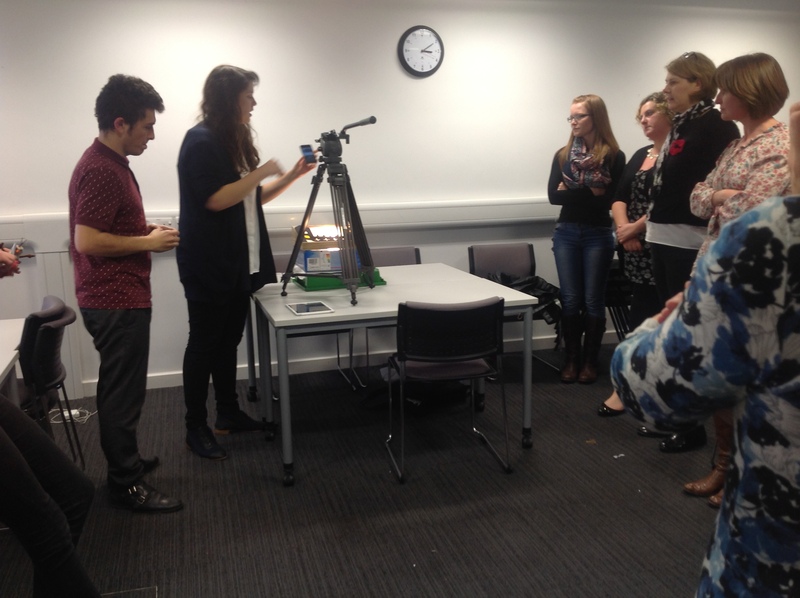 Announcing the University of Northampton and IntoFilm Playdate and TeachMeet. 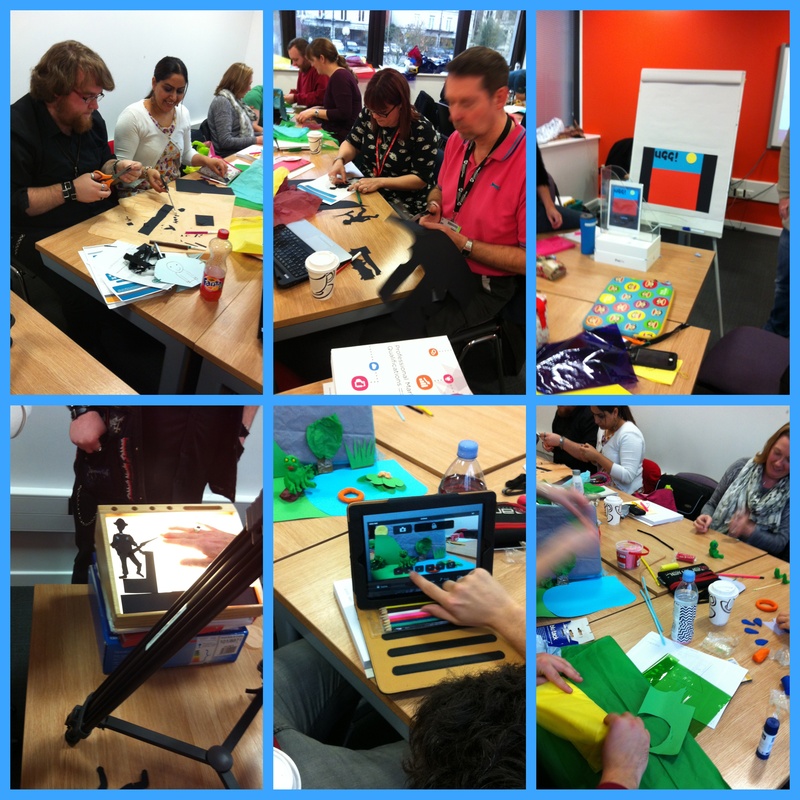 This event, for educators across primary and secondary education, combines an interactive Digital Playdate with an informative TeachMeet to provide an inspiring opportunity to tinker with new tools and technologies and explore media and digital literacy. A Digital Playdate is a chance to find out about some technologies you are curious to try through hands on play alongside others. It is based on the acronym ‘People Learning and Asking Y’. 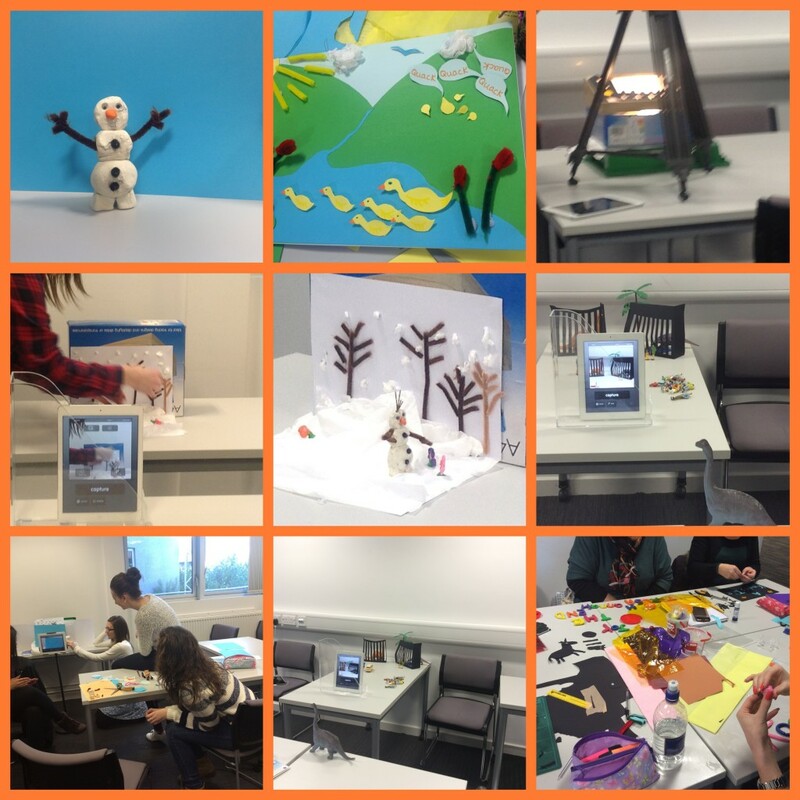 We’ll have a choice of workshops and demos for you to join in with, including greenscreening, making photospheres, iPads full of apps, virtual reality headsets, robots, filmmaking and animation, lightboxes and dark dens. There will be digital leaders at hand to support your playful exploration. There will also be short presentations on media and digital literacy so that you can hear about some of the great practice happening around the country. You’ll go away with some fresh skills that you are confident to try out with your learners. At the end of the event we will have time for participants to share what they’ve learnt and we’ll be encouraging everyone to take part in the conversation on Twitter throughout the event. If you are interested in providing a presentation for the TeachMeet section please indicate this when booking your ticket and we will be in touch to confirm details. Slots of 3 or 5 minutes will be available. Spaces are limited so please get in touch as soon as you can if you’d like to present. Where Newton Grand Hall, Avenue Campus, The University of Northampton, St George’s Avenue, Northampton, Nn2 6JD. 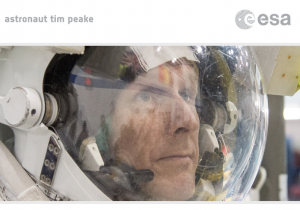 Following on from last week’s post about Tim Peake’s mission on the International Space Station (ISS) from this week we have the opportunity to view the ISS as it moves across the UK each day. 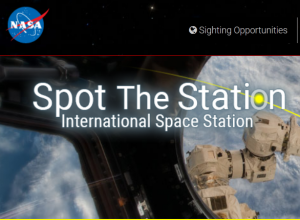 The NASA website ‘Spot the Station’ allows us to check the times when the ISS will be moving overhead. 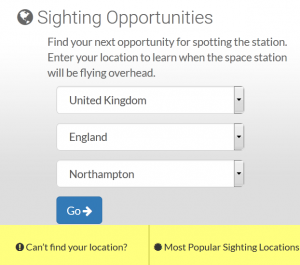 You can enter your location to check the dates and times to look out for the ISS. If the sky is clear you can see the ISS tomorrow (Wednesday 3rd February) you’ll be able to see the ISS going overhead at 6.47pm. On Thursday 4th you can see it at 5.55pm and 7.30pm and on Friday 5th February at 6.37pm and 8.13pm. You’ll need to keep an eye on the weather forecast. There’s potential for learning in science, technology, engineering and mathematics through exploring the ISS from the earth. You could learn about astronomy and weather forecasting. This week the second series of ‘The Secret Life of…’ starts. Last time it was focused on four year olds. This time it is extended to five and six year olds as well. If you watched the programmes last year you will know what to expect – a ‘fly in the wall’ insight into the daily school life of a group of children with a focus on their friendships and interactions. This time it will be interesting to see the differences between the younger and older children. From your point of view as students you might like to consider the ethics of this filming of young children – how does this relate to the need for informed consent? There is a clip about the making of the programme that you might find interesting. Film making with Into Film! Rico and Sophie, explaining how to use the equipment. 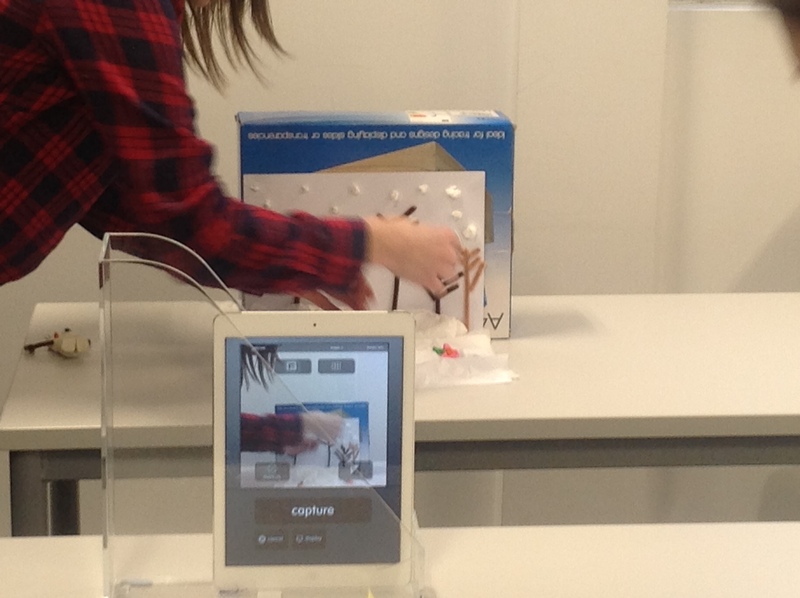 Over the last few weeks we have been exploring digital technology with FDLT Y2 students. We were fortunate to have support from Rico Lowson and Sophie Burrows from the organisation Into Film. In the first session Rico and Sophie introduced animation and shared some ideas to help children understand were the process had come from. This included exploring the illusion of movement created by the ‘persistence of vision’. this can be explored through looking at the work of Eadweard Muybridge, an artist working with photography at its earliest stages, or making flip books, zoetropes or thaumatropes. if you haven’t got a tripod, you can use a clear plastic file stand to hold the ipad still as you work. Using digital technology we can now make a range of simple types of animation in the classroom. 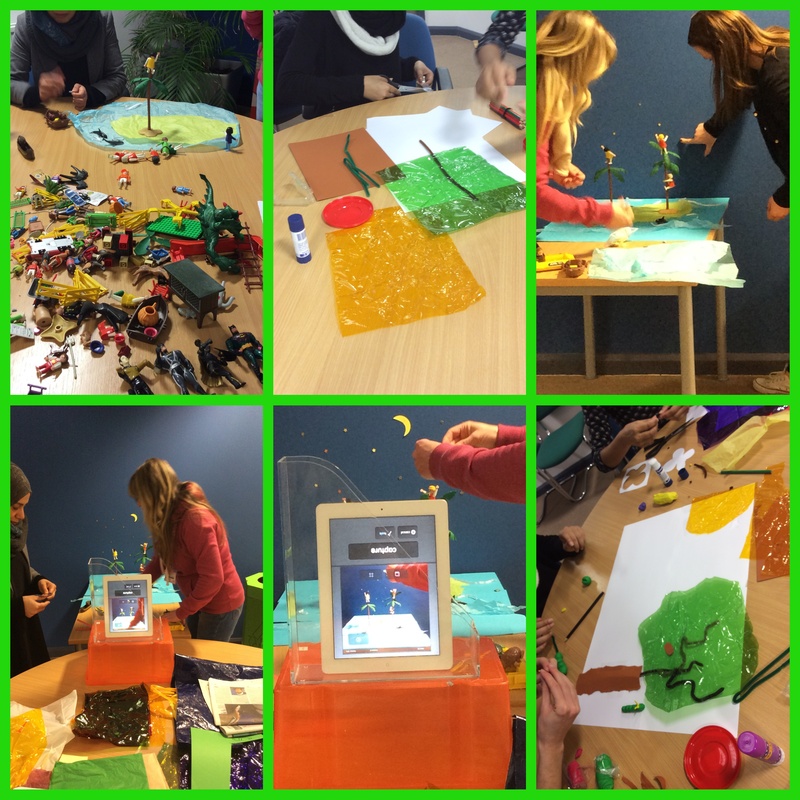 Rico and Sophie introduced us to claymation (using plasticiene), paper cut-outs and silhouette animations. In the sessions students used the apps imotion, imotionR and imovie to film and edit animations, and it is possible to use other equipment and software as well. It was very useful (for both students and tutors!) to have Rico and Sophie with us to show us examples and give us practical tips. going through and deleting any shots of hands in the imotion app, before exporting to imovie. Reflecting upon the experience (both as observer and film maker) I was interested in the possibilities for learning inherent in the activity of creating a stop go animation. Teamwork, co-operation and negotiation was vital throughout the process. Creativity, having ideas and making them real, was apparent from beginning to end and there was so much practical problem solving. It was essential to be organised in both planning and filming the animation and there were numerous roles to perform at each stage. As adults with limited time in a taught session we produced enough of a film to get a sense of the overall process but I can imagine that going from the initial idea to the end product could be an absorbing and rewarding experience – and a film show on a big screen would be great occasion in school! The Oadby group at work. In Northamptonshire there is an organisation called filmnorthants who will screen films from children and adult film makers – this could be a great opportunity for class films. Another possibility is setting up a film or animation club after school or at lunchtime – many children are keen to learn how to do this and pursue it in their own time as well as at school. The CPD session that Rico and Sophie led for us was a great springboard to having a go ourselves, first with their support and later on our own – you can contact them through Into Film. If you are a school who would like to book training for 15 or more staff, you can email CPD@intofilm.org or ask to speak to the CPD team on 020 7288 4520. This summer various incidents have made us think about the safety and etiquette of using social media in its various forms. As people involved in education and working with children and young people we have a role to play in this. How does this issue affect you in your professional role? How does it affect you personally? This summer the issues around etiquette and safety when social networking in its various forms have been highlighted by a number of worrying incidents. As always schools and educators have a vital role to play in this. How does this affect you in your professional role and in your personal role?